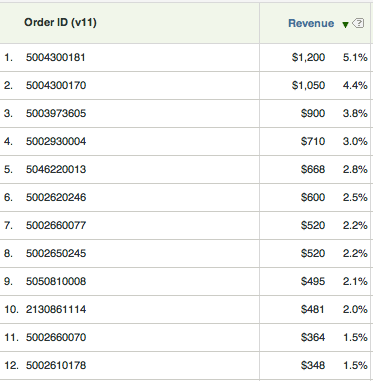 When it comes to tracking online purchases in SiteCatalyst, there are many different ways to report on Orders, Units and Revenue. There are the standard shopping cart metrics and an easy way to create calculated metrics using those cart metrics, such as Average Order Value (AOV). However, a question I get from time to time is related to looking at website data by how much money visitors spend in an Order. In this post, I will share some thoughts on how to add Revenue Bands to your SiteCatalyst implementation. So what do I mean by Revenue Bands? 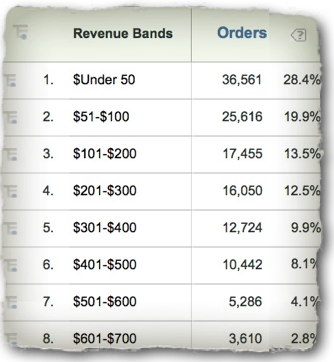 I think of Revenue Bands as groupings of revenue amounts by which you can view any of your SiteCatalyst Success Events. For example, let’s say that your boss comes to you and wants to know what percent of Orders taking place last week were between $200 and $300. That seems like an easy question for SiteCatalyst to answer right? But how would you actually answer it? In the past, I have shown how you could use a Counter eVar to store and accrue Revenue to Date, but that answers a related, but different question than the one at hand. One way to answer this question would be to use Segmentation. You could create a segment in which Orders were greater than $300 and less than $400 and then apply this to any SiteCatalyst report. However, you may get future questions asking for different amounts, such as Orders greater than $400 or greater than $500, etc. This would necessitate creating multiple different segments, which might be annoying after a while. However, this would be a pain to keep updated so I would steer away from this option. Obviously, you can also capture the raw revenue amounts in an eVar and use SAINT Classifications to group into Revenue Bands. This would provide more flexibility, but also adds a bit more work. If you are set with your Revenue Bands, I would use the preceding approach, otherwise just pass in the raw Revenue Amounts. However, if passing in raw Revenue amounts, I highly suggest you remove the “cents” portion of the revenue amount so your SAINT Classifications are much easier! This new eVar can also be used for segmentation purposes and actually makes the building of segments a bit easier (in my opinion). So there you have it. 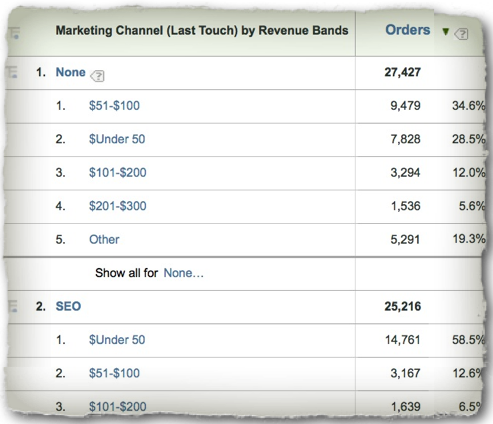 A simple way to add Revenue Bands to your SiteCatalyst reporting…Enjoy! Thanks Adam, how would you suggest catering for potential duplicate order amounts being captured into the eVar due to page reloads. Perhaps using event serialization (unique value) with the purchaseId would help with that. Can you see any issues with doing that?